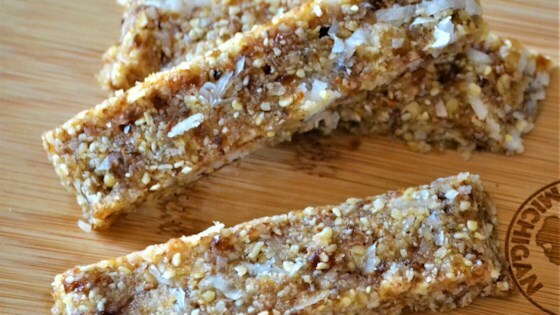 "The on-the-go, travel-light snack bar. Derived from a famous raw food bar and the ultimate in 'foodie!' This is a great snack for the active lifestyle and impressive to hand out to others. As an outdoor professional I take these in the back country and they need not be refrigerated and give great energy. Cut into bars and enjoy or wrap individually for on the go." Blend almonds and coconut in a food processor; add dates and pulse until combined. Add cashews and coconut oil; pulse until mixture is thick and sticks together. Transfer to a sheet of waxed paper; form into a square, folding sides of waxed paper over the top. Refrigerate until solid, at least 30 minutes. I make a similar recipe using choc. chips instead of coconut to give it a little sweetness - the end result tastes just like cookie dough! Delicious and healthy snack when you`re on the run. I added dried cranberries, flax and chia, walnuts and sunflower kernels. Kind of threw together what I had. My husband needed them for a school survival trip. His classmates raved! My dates were dry so I heated them up with a bit of water in a pot on the stove before blending them in. Nutritious and delicious!